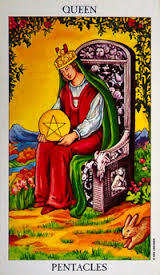 The Queen of Pentacles is showing her richness with carvings of fruit trees, goats, angels, and other symbols of material success and sensual pleasure. The tree above her and the ground beneath her feet are rich with flowers and ripe plants of all sorts and she holds in her hand a single golden pentacle. At the very lower right-hand corner of the card a rabbit, the symbol of reproduction and fertility, leaps out from behind some bushes. The Queen of Pentacles is a very ‘motherly’ card – expressing practical and grounded energy. She is the original Earth Mother. Here, she shows her love hosting and entertaining, by cooking, cleaning, keeping a warm and inviting home and bringing in a decent income to support the family financially. And, she is also able to work a full-time job, take care of the children, keep the house clean and still have time for a boyfriend! She strives to create a warm and secure environment for her family and loved ones. She represents prosperity and security. In a tarot card reading ,this queen represents the “nurturing mother Earth” that understands the importance of safeguarding and protecting the physical world for next generations. This card may announce also fertility or pregnancy, material abundance and sensual delights. Business woman – organizer – talented for wealth administration – Resourceful. Bighearted – No rush with love, time is on your favor for abundance and financial security. The team player – Philanthropist – Someone concern with the welfare of others.